Last year, we were invited to Armenia. Our first reaction was where is Armenia? Our second reaction was, let’s go and find out. 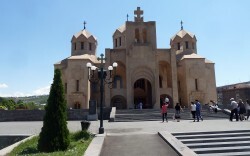 So in June 2013 we went to Armenia. It is quite easy to describe where Armenia is: you go to Turkey, go to the far end where you will find Mount Ararat, where Noah’s Ark eventually came to land, go up and over the mountain and when you come down the other side you are in Armenia. The trouble is however, that the Turks do not speak to the Armenians. Armenia once spread over much of what is today eastern Turkey – indeed the Armenians always talk of ‘Greater Armenia’ which includes not only modern ‘eastern’ Armenia but also ‘western’ Armenia which today forms a large part of eastern Turkey. Where, or what is Armenia? Modern Armenia is the reddish area to the right, with the disputed territory of Karabagh in the deeper red. The orange/brown is ‘Greater’ Armenia, where substantial Armenian populations have lived in the past, and where there are Monuments/churches of Armenian type as marked. It is a sad story because in 1915 the Turks panicked and eliminated over one million Armenians – there is a huge dispute as to whether it should be called genocide or not. But at the same time even more Armenians migrated to America: it is said that there are more Armenians in America than in Armenia itself. But this means that the Armenians and the Turks still do not speak to each other, so instead of flying out to Istanbul and then on to Armenia, you fly east to Moscow and then take another plane of Siberian Airways (the Russian Easyjet) turn right angles and fly south to Armenia. We flew out to Yerevan, the capital of Armenia. 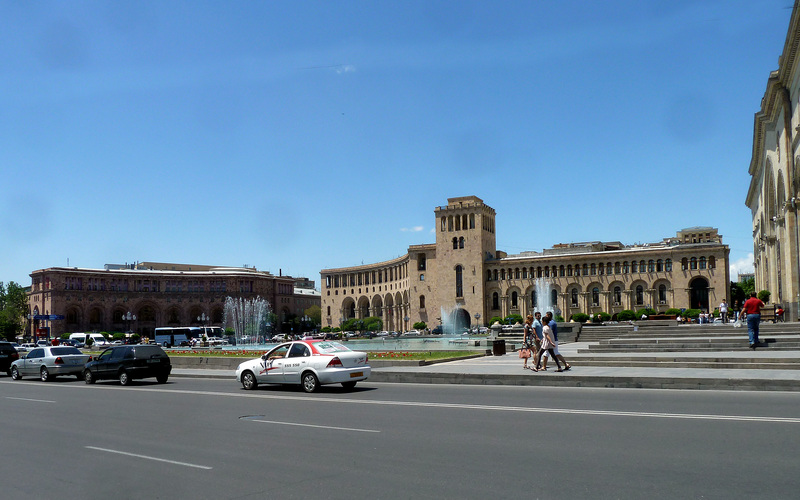 Yerevan has a population of one million out of the three million total population of Armenia. It is tempting to say that Yerevan is totally non-archaeological, but at the same time, if one can allow the 20th century to be a subject of archaeological study, Yerevan is fascinating, for Yerevan is the perfect Soviet city. 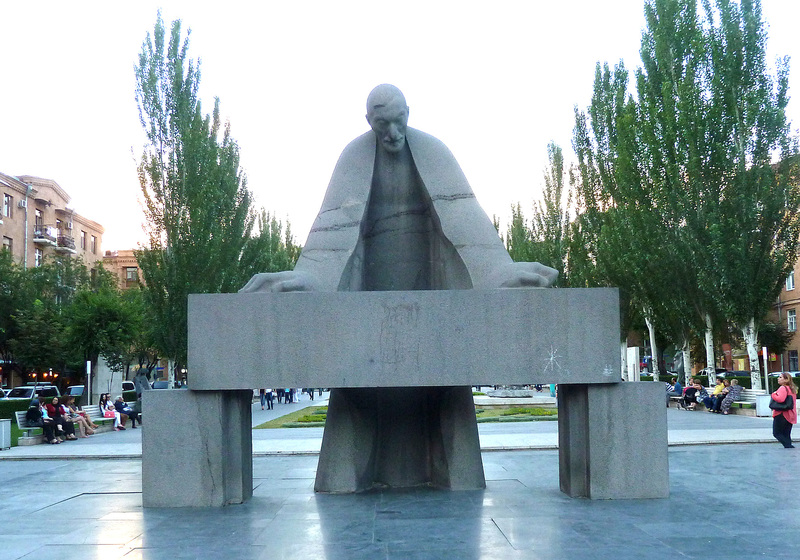 If you want to see what Soviet architecture should be like, go to Yerevan. Yerevan has a changeable relationship with Soviet Russia – on the one hand Russia was their great ally against the Turks, and on the other hand, Armenia was the ideal satellite: the Armenians are intelligent, hardworking and entrepreneurial, and the Russians kept them on the whole on a fairly loose lead, and in a mild sort of way they thrived. 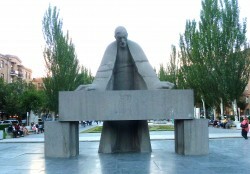 Thus Yerevan became the ‘blue-eyed boy’ of the Soviet Empire thanks to one of the world’s great architects – Alexander Tamanian. Just imagine what London would be like if Christopher Wren instead of building a mere ninety churches and St. Paul’s, had been able to re-plan London after the Great Fire as he desired. The dancing fountains in Republic Square, dancing the Ride of the Valkyrie. In the background is the ghostly outline of the National Museum. 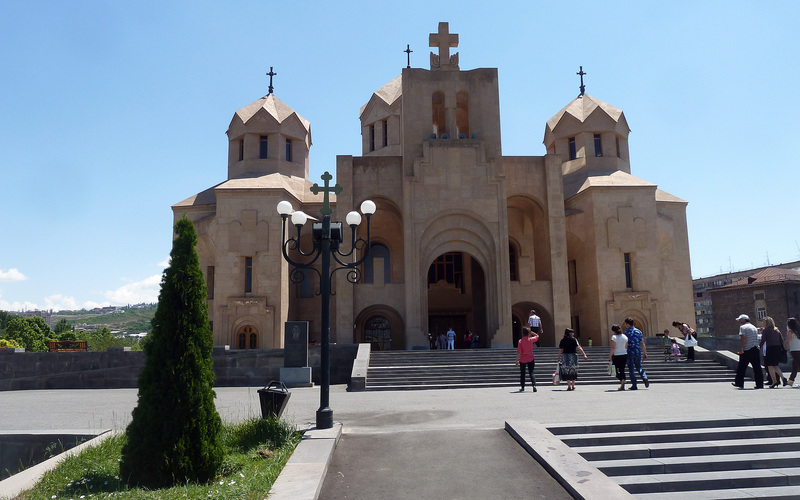 The new cathedral at Yerevan inaugurated in 200X and built out of the profits of the mixer tap. Well, Tamanian had that opportunity in Yerevan. He worked the Soviet system with great skill and Yerevan today is his masterpiece. At the heart was Lenin Square, today renamed Republic Square: the statue of Lenin has been pulled down and in front of the Great National museum are some fountains which are illuminated at night and made to dance in tune to the loud speakers set in front of the National Museum. We watched a superb performance of the Ride of the Valkyries – I hope Tamanian would have approved. He surrounded the city with a wide green boulevard where today a modern cathedral has been erected, paid for by Alex Manoogian, an American Armenian who went into ironmongery, invented the mixer-tap and became very rich. 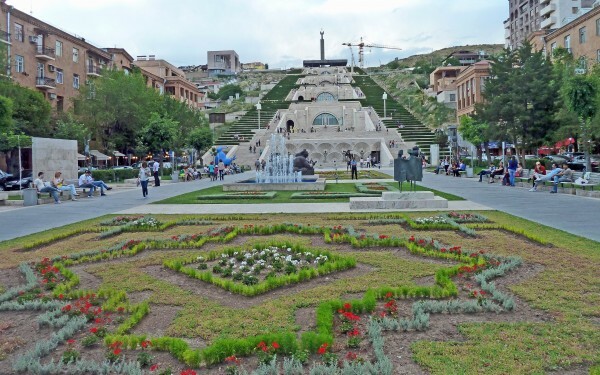 There is also a superb Cascade planned to celebrate fifty years of Soviet Armenia but when the Soviet Union failed to reach its fiftieth anniversary, it was abandoned and had to be rescued by another rich American Armenian, Gerard Cafesjian. At its foot is a fine statue of Tamanian looking out over the city which he planned (for further details see www.armeniapast.com). But what of Armenian archaeology? Here, brooding over the whole subject is the huge question of Greater Armenia. Does Greater Armenia really exist? How far back can we trace the story of Armenia? 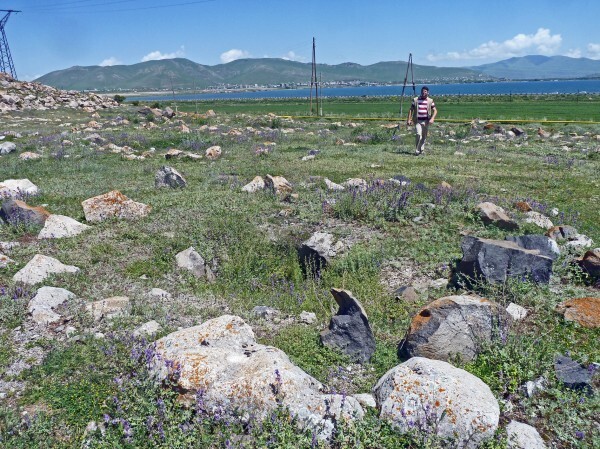 Did it really embrace both modern Armenia and ‘Western Armenia’ with its heart at Van, near Lake Van, today near the centre of Turkey, but where the Uratu, the Iron Age predecessors to the Armenians, had their capital? The accompanying map by Hakob Simonyan is a distribution map both of Prehistoric and of Christian sites which can be considered to be Armenian. Skipping over the Palaeolithic, the first site that we saw was Shengavit, today in the south eastern suburbs of Yerevan. Shengavit belongs to what in my youth I knew as the ‘Kura-Araxes’ culture: Armenia is essentially an upland country and the birth place of many of the world’s great rivers. To the west and south rise the Tigris and Euphrates, though the source of both is admittedly in what is today eastern Turkey. To the north and east are the rivers Kura and Araxes which turn eastwards and eventually flow through Azerbaijan to the Caspian Sea. And the importance of the archaeology of Armenia is that it is subject to two main influences: from the Mesopotamian world of the Tigris and the Euphrates to the south, and from the steppes of central Asia to the north – the birth place of horses and chariots. 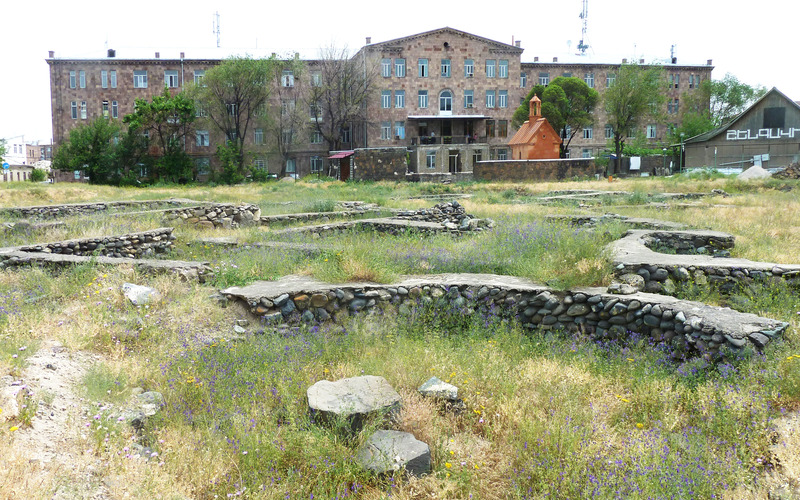 In the 1970s the Soviets decided to build a hospital on the low hill on which the Neolithic town of Shengavit was sited. In the foreground are some of the excavated houses in the western half of the site. The hospital has destroyed most of the eastern part of the site. 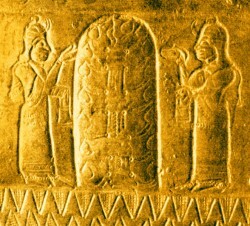 In the ‘Kura-Araxes’ culture, the Mesopotamian influence seems to be dominant and Shengavit is the best example of this. 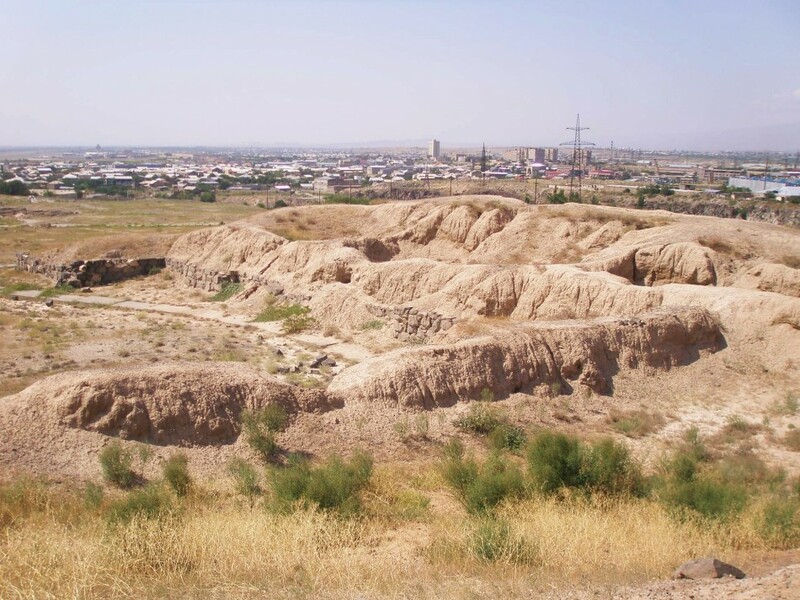 Shengavit was first discovered as a Neolithic site in the 1930s and was extensively excavated from 1958-1983. But since 2000 further excavations have been carried out by Hakob Simonyan, our guide and mentor during our stay in Armenia. Shengavit lies on a low hill just beyond the south western suburbs of the city, but in the 1970s the Soviets came along and decided it would be an ideal site for a new hospital, and despite the protestations of the archaeologists, a new hospital was erected which now occupies over half the area of the this very extensive hillfort town. 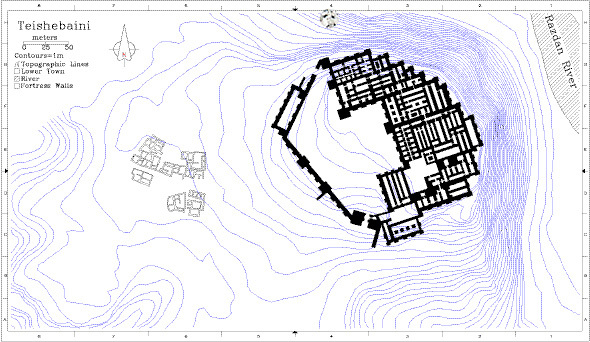 Nevertheless a substantial area has been excavated in the centre showing a jumble of roundhouses and some rectangular ones, but mostly contiguous to each other. 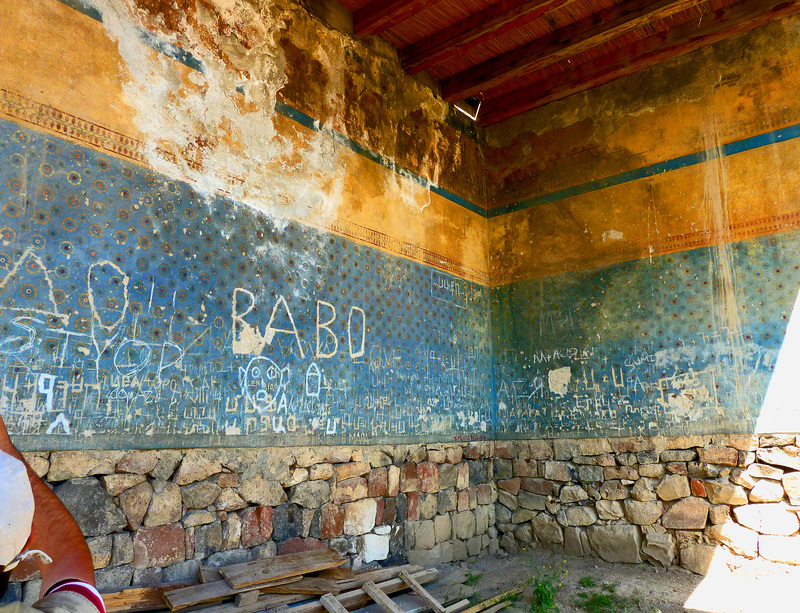 No palace has yet been found, but last year Hakob discovered what he believed to be a temple. This is a rectangular semi-subterranean structure approached by two steps leading down into it. In the far corner was a low altar and in front of it was a clover-leaf shaped terracotta hearth where the sacred fire burned. In the opposite corner are two bins in which the ashes from the sacred fire were placed –even the ash was sacred and had to be preserved. 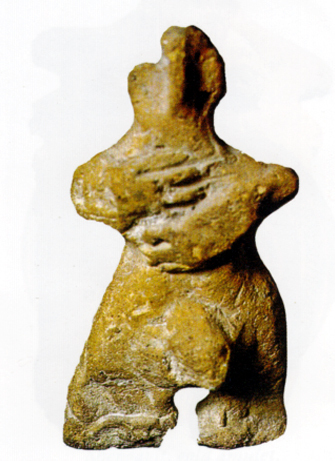 In the fill was a phallic pendant idol which may have been the distinguishing mark of the priestess. Shengavit begins to look like a proper town. 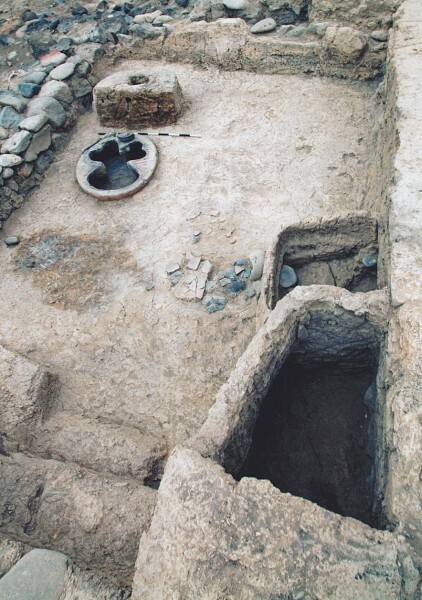 In the Shengavit period, the emphasis is on towns, but coming down into the Middle Bronze Age in the second millennium BC the emphasis shifts to rich burials. Some of the richest contained the burials of horses and chariots. Is this the influence from the north, from the steppes of central Asia? Were these the horsemen and charioteers, proto Armenians who introduced horses and chariots into the fertile crescent? This is a hot topic – read Dr Simonyan’s article that accompanies this article. One of the timber wagons found perfectly preserved when the level of Lake Lchashen was lowered. Note the withies over the cart on which the body would have been placed. When one goes into the National Museum the most stunning display is of two chariots, or rather carts. They were not chariots but four-wheel carts probably catafalques – that is a cart on which a body is placed for its funeral procession to the grave. The cart and horses are then buried with the hero. One reads about these chariots, but one rarely sees them in the flesh and the Yerevan Museum has two of them. How were they preserved? 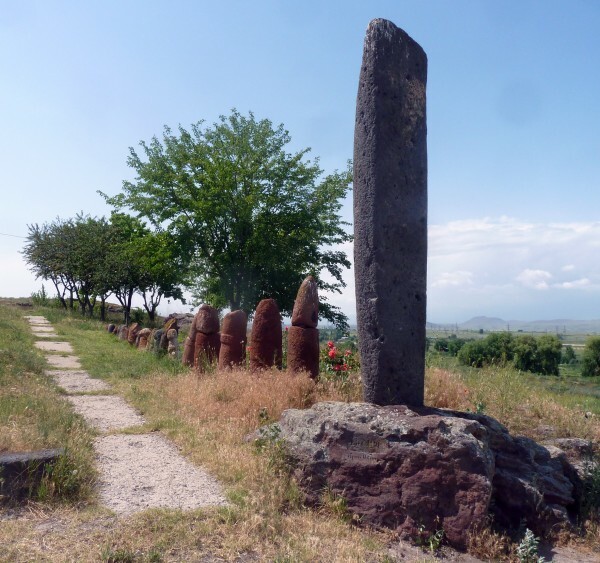 In the Bronze Age, Armenia becomes part of what is known as the ‘early kurgan’ culture. Kurgan is a word of Turkish origin and means essentially a barrow: usually a single burial in a pit grave covered by a heap of stones. Kurgans are found all over the steppes of central Asia and spreading down into Eastern Europe and into the fringes of the fertile crescent. In the past they have been linked by Maria Gimbutas with the spread of the Indo-European languages, though this idea is no longer fashionable. But kurgans are also linked with the spread of horses and chariots: was the arrival of chariots in Mesopotamia something that spread from the north and from the Kurgan cultures, and what part did Armenia play in all this? The first excavations of kurgans in the south Caucasus took place in the 1940s when a dozen or more barrows were uncovered in a rescue excavation at Trialeti in Georgia, but subsequently over a dozen rich kurgans have been excavated in Armenia. The most spectacular were those excavated at Lcashen on the borders of Lake Sevan where a number of almost complete wagons and chariots were uncovered, two of which form a spectacular display in the National Museum. View over Lake Sevan, Armenia’s largest lake high up in the Caucuses – the third highest lake in the world. In the foreground are the remains of the Bronze Age and Uratian fortress. 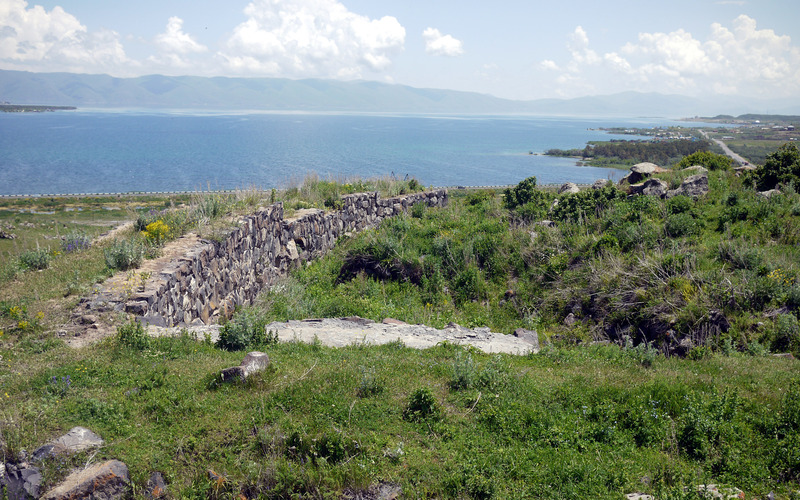 Lake Sevan is the largest lake in modern Armenia but it is landlocked and much of the water is lost through evaporation, and so the Soviets in their enthusiasm for water management decided to lower the level of the lake to provide more fertile land. They had a similar scheme with the Sea of Aral where they diverted the waters of the Amu Darya to grow cotton in the central Asian plain. The cotton now flourishes but the Aral Sea has shrunk to a mere tenth of its former extent. Perhaps thankfully the level of Lake Sevan was only lowered by some 10 metres. However the lowering of the level had a fascinating by-product for the archaeologists, for it revealed the former Bronze Age surface covered with kurgans. 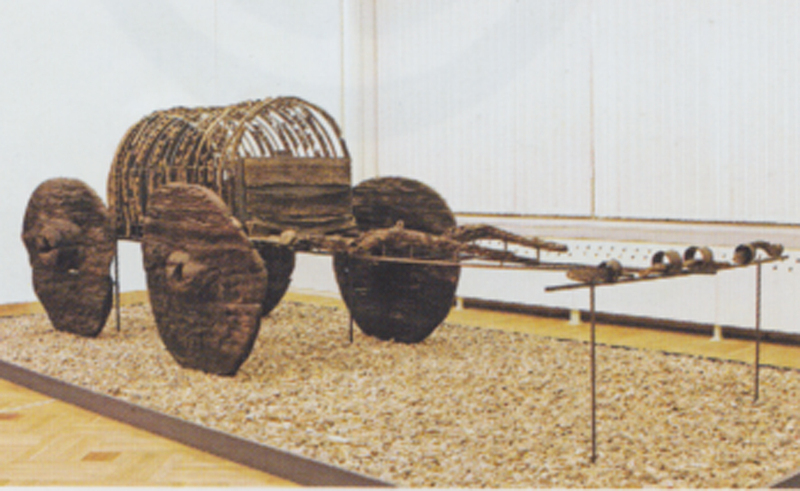 The excavations at Lchashen, undertaken by the History Museum of Armenia and the Institute of Archaeology and led by archaeologist Harutian Nakatachien are not yet fully published, but among the discoveries were sumptuous wooden catafalque carts, with the ashes of the chiefs, unique examples of arms and armour, and highly artistic sculptures of animals. The burials were made in burial chambers, the walls of which were made of slabs weighing 2 to 5 tons. The ceilings were covered by logs supported by solid wooden columns, and the vaulted roof of huge slabs was placed thereon. The most spectacular discoveries are were more than a dozen four-wheeled and two wheeled wagons, as well as two wheeled chariots with spoked wheels – evidence that at least as early as the Bronze Age chariots were being used in the Caucasus. Two of these carts are on display in the National Museum and make one of the more spectacular displays. One of the four-wheeled wagons was a covered cart with the semicircular roof made out of withies still preserved. At the time, Prof Stuart Piggott was fascinated and included them in his classic book on The Earliest Wheeled Transport. 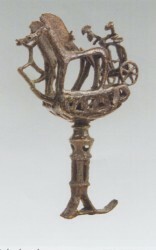 However even more important are the bronze miniatures showing two-horse chariots, with two warriors standing on the body bronze: one model shows the war machine swiftly rushing into the battle (fig. 1), the other is marching solemnly, as if in a triumphal victory parade: the warriors standing on its body are raising their hands in salute to the welcoming crowd. We date these chariots to around 1500 BC or even earlier, i.e. they are contemporaries of the conquest of Babylon. 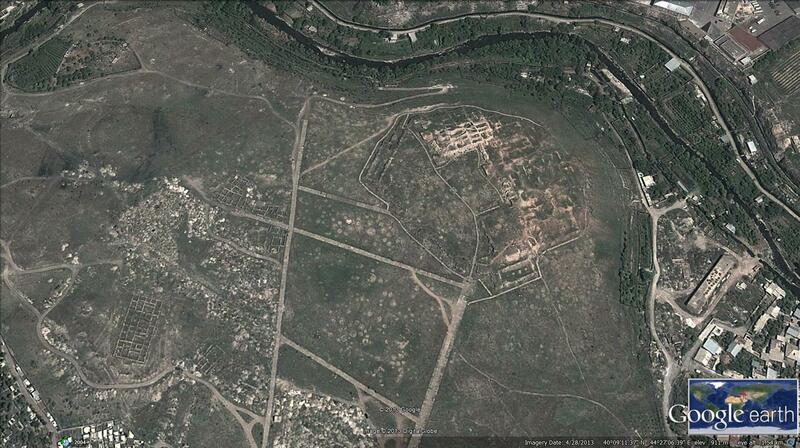 The other major Bronze Age site in Armenia is Metsamor. Today to the modern Armenians, Metsamor means one thing: it is the site of the atomic power station built by the Soviets in the 1970s, which still provides 40% of Armenian electricity. The EU wants to decommission it, but decommission it and the Armenians will go cold. It is still running. 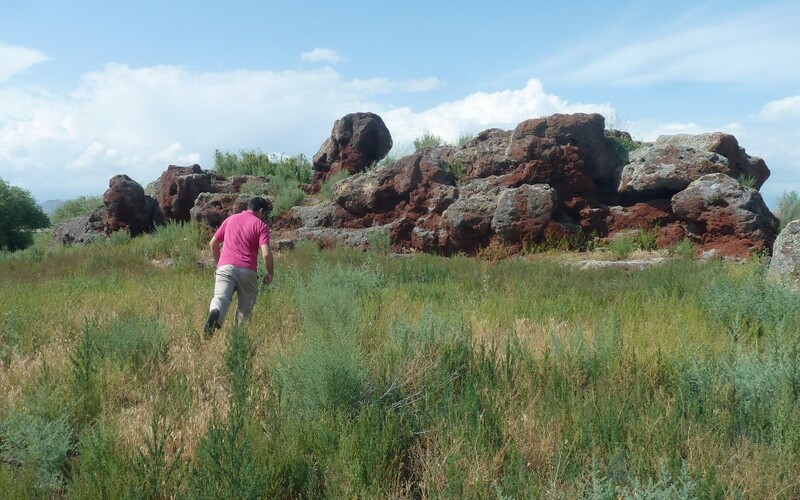 However a mile and a half from the atomic power station is the archaeology site at Metsamor, which was extensively excavated from 1965 – 1996 by a redoubtable lady, Emma Khanzadian, who has now passed away and the site remains as her memorial. In the 1970s a museum was erected at the entrance to the site and just outside the museum is a row of standing stones brought together from various parts of the site. Most of them appear to be Uratian for whom there were phallic symbols, demonstrating to their enemies the virility of their warriors. At the front however is a Vishap stone dating to the early Bronze Age. 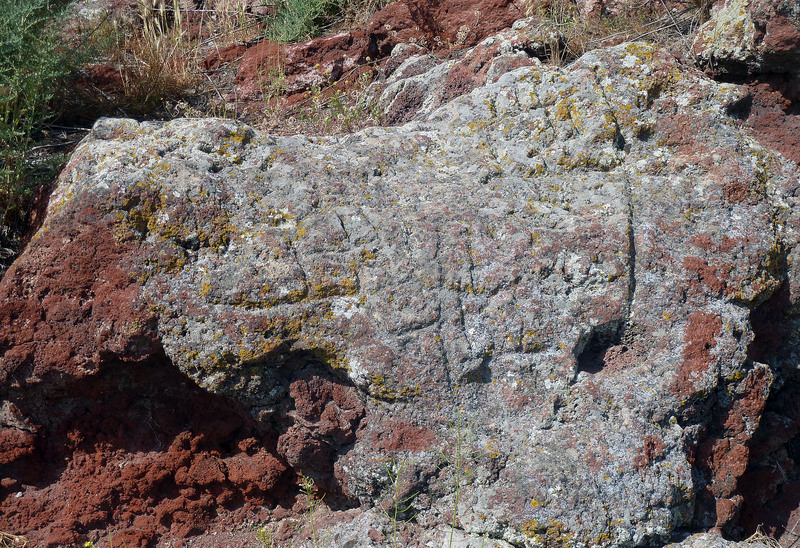 These are one of the more enigmatic features of Armenian archaeology. They appear to be connected with water and are found extensively in the highlands of Armenia. 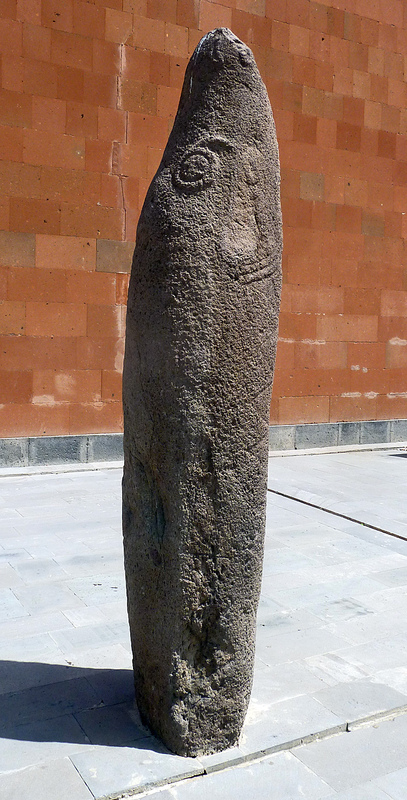 (Insert here photo of the Vishap stone from the Sardarapat museum). The secret of Metsamor appears to have been that it was a mining town situated over a rich vein of copper, from which extensive mining activity remain. Copper was mined not only in the Bronze Age but also down into the Uratian (early Iron Age) period: there are some spectacular defences mostly of the Uratian period. 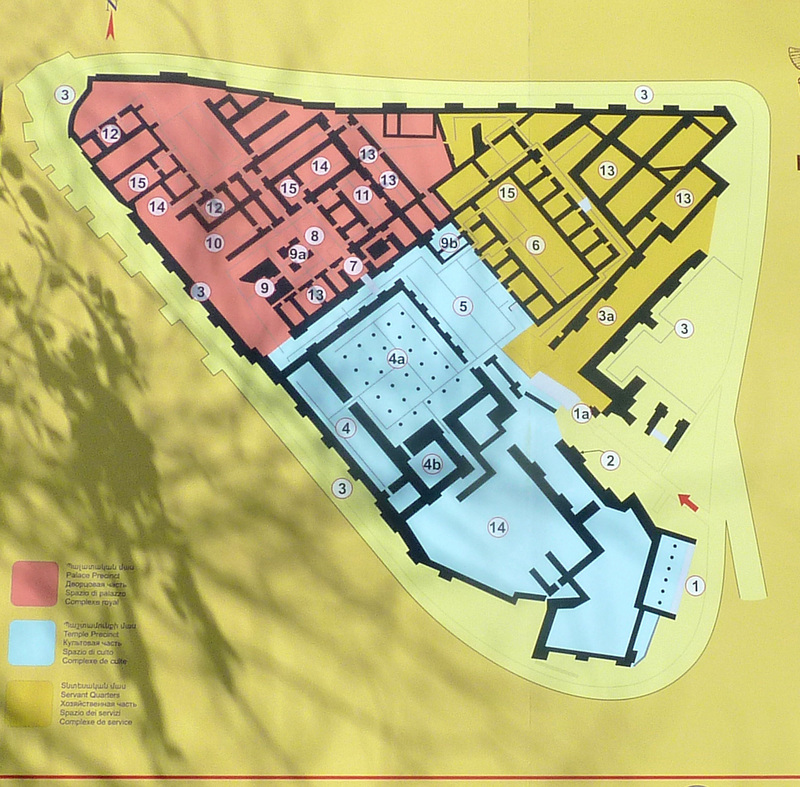 There was also an extensive Medieval settlement. But the most spectacular discovery was that of a very extensive and rich Bronze Age cemetery excavated by Madame Khanzadian in the 1970s. This revealed a considerable quantity of rich jewellery now on display in the basement of the museum. The most exotic are some gem stones with Mesopotamian writing on them which must have come from Mesopotamia. These form the core of Dr Simonyan’s argument in the accompanying article, that the destruction of Babylon in 1539, recorded in Hittite sources was carried out with the help of the Armenians who brought back these gem stones as loot. 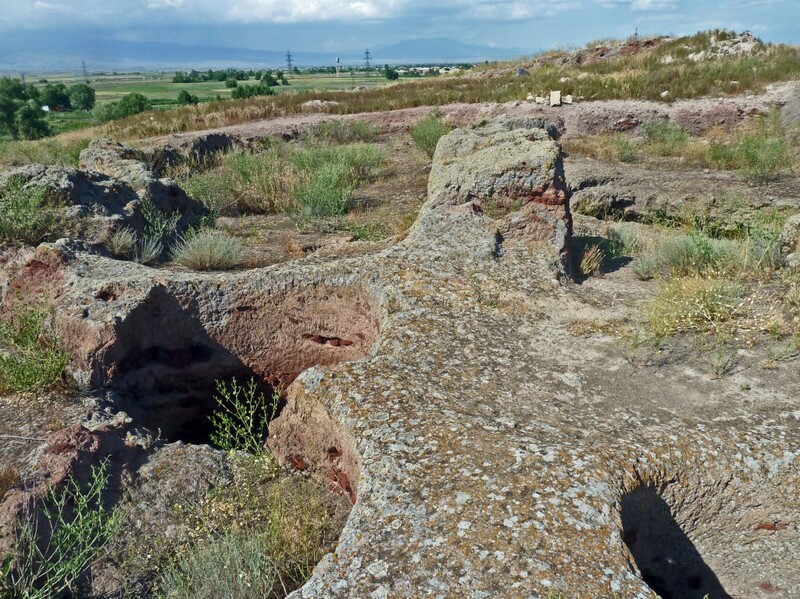 However the aspect of Metsamor which it is best known is a rocky knoll about half a mile away, which is covered with presumably Bronze Age engravings not unlike the cut and ring marks of our British Bronze Age. These have been extensively explored and wildly interpreted; indeed, one has been interpreted as being a map of the waterworks marked by the Vishap stones. I scrambled over it as best I could, and discovered a number of the carvings, but as usual I remained sceptical as to whether we shall ever be able to interpret whatever meaning they may have had. The Urartu who flourished in the early Iron Age from around 1100 down to 700 are perhaps the highlight of Armenian archaeology for they are the first literate people in Armenia: are they proto-Armenians? They were ‘discovered’ in the late 19th century by the scholars who were transcribing the newly unearthed cuneiform tablets, and finding new languages in the process. The majority were written in Assyrian, but they then began to realise that there was another language involved which came to be called ‘ Hittite’. The discovery of a great hoard of tablets at the Hittite capital of Bogazkoy, in Turkey confirmed the existence of this great empire that had hitherto been totally lost. 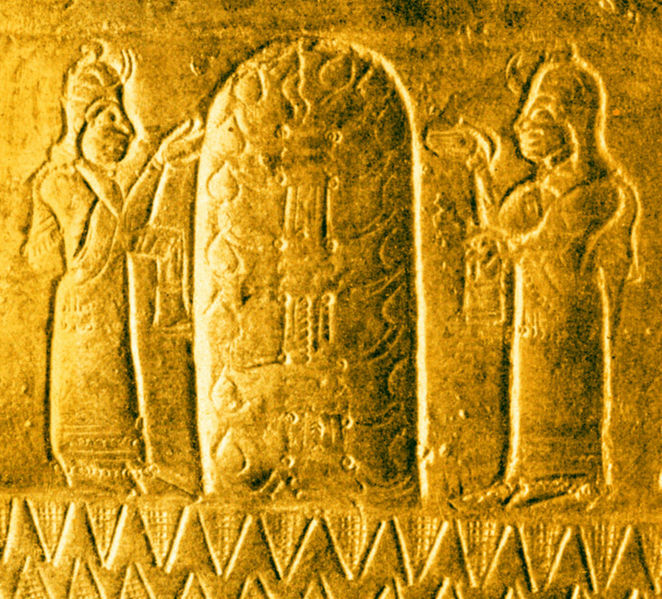 But then they began recognising tablets in a third language – the language of the Urartu centred in Armenia. Bi-lingual inscriptions were discovered and eventually the Urartu came into history. The capital of the Urartu was at a site called Tushpa which is identified as modern Van, by Lake Van in the centre of modern Turkey, where the thriving Armenian town was destroyed in 1915 and remains a ruin. 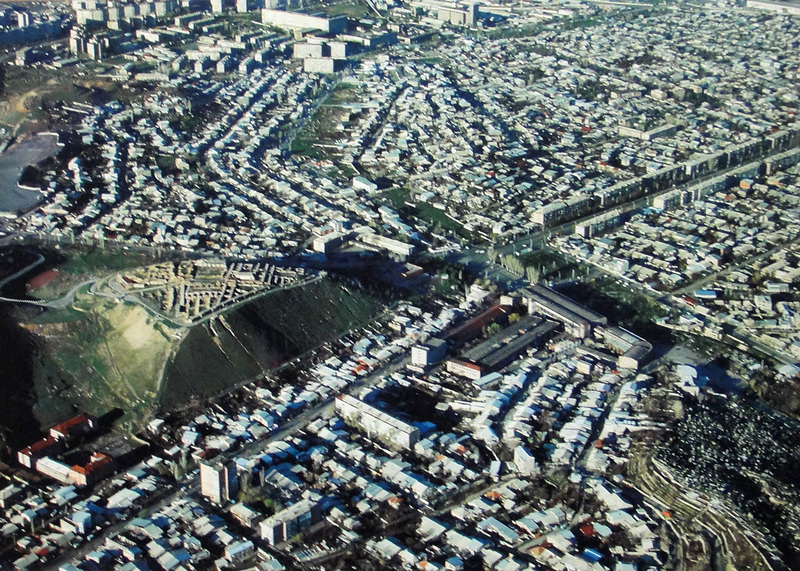 However two major hillforts have been excavated in Armenia itself, both in the suburbs of Yerevan. 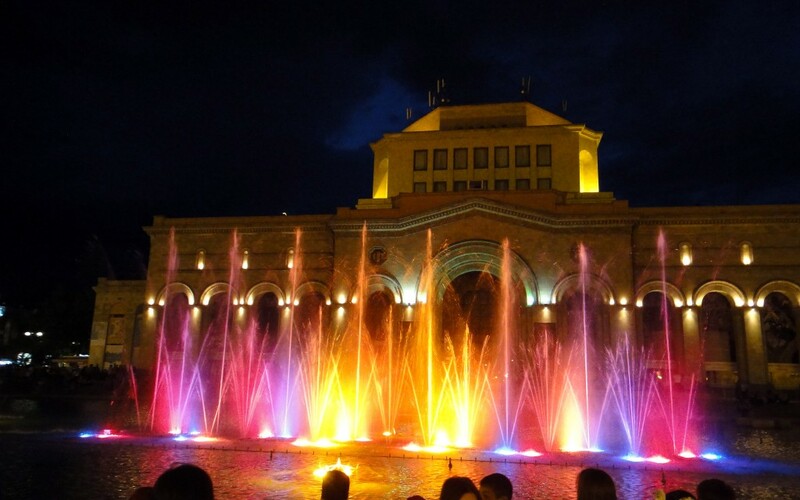 The best known is Erebuni in the south eastern suburb of Yerevan; indeed it is even possible that the name of Yerevan is derived from Erebuni. It is today a splendidly laid out site and is the number one archaeological site in Armenia to which every school boy is taken: here is the beginning of Armenia. It is a hillfort site that was extensively excavated in the 1970s and 80s and laid out as a major visitor attraction. At the foot of the hill is a well laid out museum from which visitors climb up to the palace, though there is a back way round up to the top for coaches and distinguished visitors. 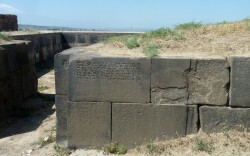 Erebuni was founded in 782 BC by King Argishti I – there is a description that says so. However it did not survive for long for in 714 or thereabouts, wild Cimmerians(?) invaded from the north and may have destroyed Erebuni. However it was subsequently restored and one suspects many of the visible remains are those of the Persians who conquered Urartu in 590. It is laid out in typical Soviet style, with walls restored and built up to waist height. 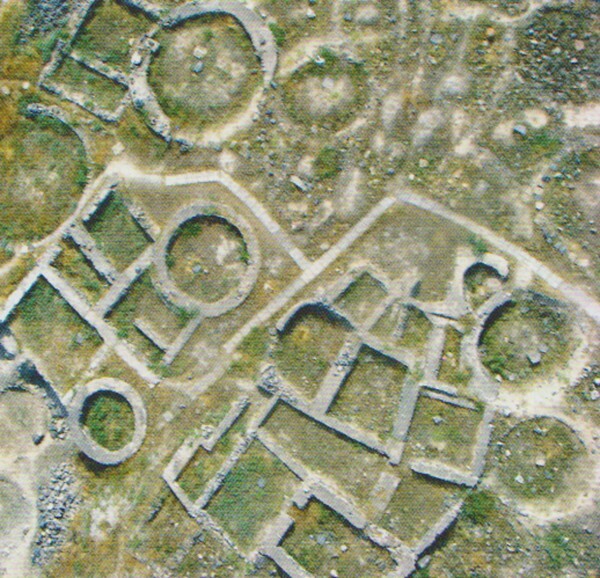 There are impressive defences in casemate style with alternating sections projecting and recessed – a style typical of the early first millennium BC in the Near East. Inside the main gate is a fine open courtyard that resembles a Persian apadana, or ceremonial court. Beyond it is a somewhat unimpressive palace with two temples at the centre – one dedicated to the god Susi – and behind it a fire temple of Zoroastrian type: both have thick foundations so they may have been tall towers. But it is clear that it is typical palace of a gift exchange economy with large numbers of granaries and storage rooms. There is no sign of any market place or any big audience chamber. Some of the decorations however still survive, the best with stars on a blue background, and a dado covered with lively figured scenes. 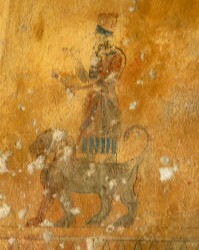 There are some interesting paintings of the god, Haldi, the great god of the Urartu who is always depicted standing on the back of a lion. There is also a second Urartian palace site only a couple of miles away at Karmir Blur, which may have been a successor site to Erebuni following its destruction. This lies not far from the Neolithic site of Shengavit and was only discovered in 1936 when a cuneiform inscription was found mentioning the King Rusa, son of Argishti. A later inscription identified the site as the city of Teisheba, who was the god of war. In 1939 a young Russian archaeologist, Boris Piotrovsky was sent down from Leningrad to investigate and he spent thirty four years excavating there. He was one of the star Russian archaeologists who eventually became head of the Hermitage Museum in Leningrad. While in Armenia he married a beautiful Armenian girl, and their son Michael succeeded his father as Director of the Hermitage. He wrote a book on the Urartu, published in English by Barrie & Rockliff – Nagel Publishers, which describes his excavations and is by far and away the best book on the Urartu, despite its lack of plans. Piotrovsky was an energetic excavator who uncovered a palace with 120 rooms spreading across more than ten acres. The excavations only uncovered the basement level with factories for the production of sesame oil, a workshop for the brewing of beer, a storeroom for grain, and enormous wine cellars with huge vessels half buried in the earthen floor. It is reckoned that more than 400,000 litres of wine could be kept in these vessels. The fortress perished around 585 BC after an Assyrian raid – bronze Assyrian arrow heads were found in the bricks of the fortress walls. During the assault fire broke out and buildings collapsed in the flames. The burning was so fierce that it coloured the rocks red, which is why it is called Karmir Blur, which means the red city. The palace that he excavated was surrounded by a huge lower city, the outline of which can be seen on the Google Earth photographs. Parts of this are being excavated; indeed Dr Simonyan has been excavating a further area this year. Little can be seen of Karmir Blur today apart from some of the massive cyclopean walls that surrounded it. We went and visited it and saw the walls, but then we were caught in an enormous thunder storm, and were soaked to the skin; but between them Karmir Blur and Erebuni provide a splendid memorial to the Urartians. In 590 the Urartu were conquered by the Persians and Armenia became a satrapy, or semi-autonomous region within the great Persian Empire. In 330 BC the Persian Empire was destroyed by Alexander the Great and in the first century BC it was taken over by the Romans who were the first to call it the Province of Armenia, and for the next 400 years Armenia sort of flourished as a sort of buffer state between the Romans and the Persians. Sometimes the Romans put in their king on the throne and sometimes the Persians put their king on the throne. The results probably differed little to the average Armenian and in a quiet way they flourished. 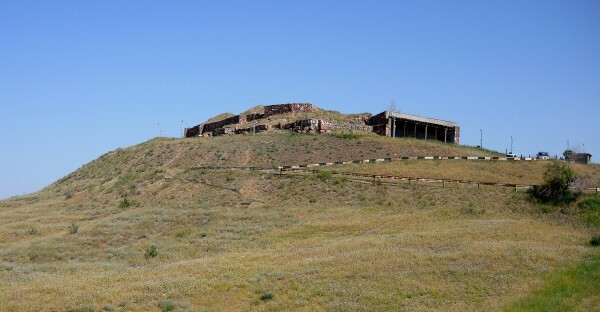 However the Roman capital at Artashat is today right on the border between Armenia and Turkey and is therefore a military zone that is not accessible to the ordinary tourist. The next stage in the Armenian story comes with the arrival of Christianity; but this is another story that must remain for a future issue.